The Benaki Museum and Aria Hotels (www.ariahotels.gr) have today announced an alliance for the Patrick and Joan Leigh Fermor House, situated in Kardamyli, Southeast Peloponnese, Greece. In 1996 Sir Patrick and Joan Leigh Fermor bequeathed their home to the Benaki Museum with the express wish that the house would host intellectuals and scholars who wanted to work or study in an inspiring setting. The Leigh Fermors also granted the museum the right to rent the property for a period of three months per year, in order to cover the running costs of the house. Under the alliance the museum will ensure the preservation of the house and its contents, and enable members of the public to have access to the property, while hospitality services will be provided by Aria Hotels, a hotel and villas company that specializes in the provision of authentic retreats in restored, historic Greek properties. The Leigh Fermor House is considered one of the most beautiful properties in Greece. Within a Mediterranean garden of cypress trees, olive trees, fragrant shrubs, white oleanders and wild flowers rolling down to the sea, stand three stone buildings: the main house, the writer’s studio and a small annexe. Sir Patrick Leigh Fermor (1915-2011), universally known as Paddy, was one of the most charismatic and adventurous personalities of the last century. An author, scholar and decorated war hero, he is celebrated as one of the finest travel writers of his generation. As a member of the British Military Mission to Greece, he played a prominent role in the Cretan resistance during the Second World War. He was a great admirer and lover of Greece. In the 1960s Leigh Fermor and his wife Joan chose to spend the rest of their lives in Greece and to build their home, lavishing much love and attention on it, in the idyllic coastal town of Kardamyli. At present, repair works at the buildings and the garden are underway so that the original character of the property is meticulously preserved. The Benaki Museum - Aria Hotels partnership will be launched in 2020. Aria Hotels has pledged that it will undertake operation of the property during the rental period with particular sensitivity to its unique legacy, offering guests a rare residential experience in an environment of immense charm and character. The Benaki Museum’s collaboration with Aria Hotels for the Patrick and Joan Leigh Fermor House will extend over the three-month rental period every year, in accordance with the terms of the bequest. 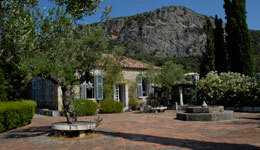 More information about the Patrick and Joan Leigh Fermor House. Aria Hotels is a family-owned boutique hotel and villas company that offers holidaymakers authentic Greek hospitality and the ultimate in simple, effortless charm. The company has several hotels and villas, all in exceptional destinations: Crete (Chania, Heraklion and Lassithi), Cyclades (Kimolos, Serifos, Milos, Santorini) and Epirus (Metsovo & Zagori). They are chosen to appeal to the discerning traveller looking for a secret hideaway in Greece. Each hotel has been selected for its architectural merit, and its contribution to the preservation of local heritage. Outstanding quality in service and accommodation are the core of the Aria Hotels experience. www.ariahotels.gr, as well as the social media Facebook , Instagram , LinkedIn and Twitter.